Redistribution without permission from the Author is forbidden. This article orginally appeared in Rail Classics and is reprinted here with permission of the author. Between three and four million years ago a giant block of granite tilted up from the earth's crust hefting aloft whatever volcanic covering it had accumulated over the eons. This newly formed mountain range was situated on what is referred to as a tilt fault so that its eastern face rose steeply off of the land while it western face flowed in a far gentler manner towards the sea. Stretching from the Cascades to the north down to Tehachapi Pass in the south it has a length of 400 miles with a width that varies between 80 and 40 miles. The mountain peaks it formed are between 6,000 and 12,000 feet. As it was rising from out of the earth's crust and shaking loose its covering man's remotest ancestors were just beginning to develop on the savannahs of Africa. As it continued to rise weathering began to strip the volcanic covering it had lifted from the granite face and glaciers moving down from the north scoured deep valleys among the peaks. These would one day provide a challenge for the men who would come to carve a crossing across them. The first men to gaze upon them came down out of Siberia to explore, hunt and eventually settle here. Ten to fifteen thousand years later they were joined by another race of men coming from the east. The first of this new breed were known as mountain men and they were soon followed by other explorers and settlers seeking a path through the glacier and river formed passes for a route to the Pacific Ocean. But the way west was seldom easily accomplished. By the 1850's plans were formed for a way to force a passage through these mountains that were now being called the Sierra Nevadas (Spanish for snow covered). Not just a route for horses or wagons but instead for a railroad that would provide a route from the east coast of the United States to its west coast. It was to be a northern route. The Los Angeles of the time was just a sleepy pueblo and gold had been discovered in the hills around Sacramento. The great California port was located to the west in San Francisco Bay. Because of the tilt to the massive block of granite the western face would provide more of the gradual climb needed by a railroad but once at the summit the engineers had to come up with a way to climb down the other side. 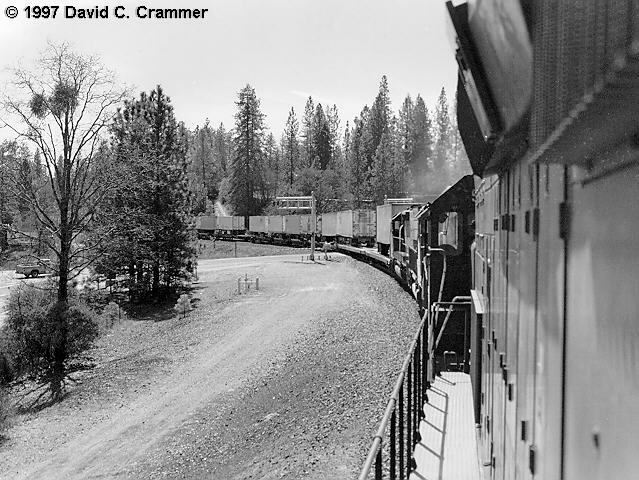 Surveyed by Theodore Dehone Judah and Dr Daniel W. Strong the Donner Pass route was selected as the way through the mountains for the railroad. Carved across and through the face of the Sierra Nevadas in the 1860's It is this route that we will be riding with the Southern Pacific today. It's a warm March morning in Roseville as the crew prepares to take a train over The Hill. 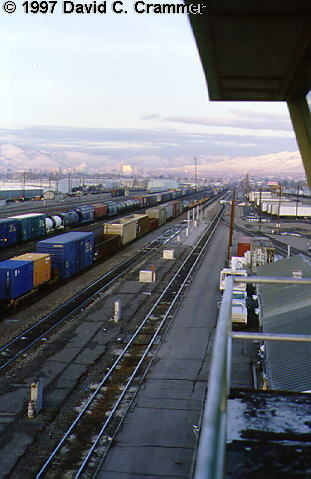 In front of the yard's tower which states in large black letters "1600 VERNON STREET" The rear of the train is being setup. 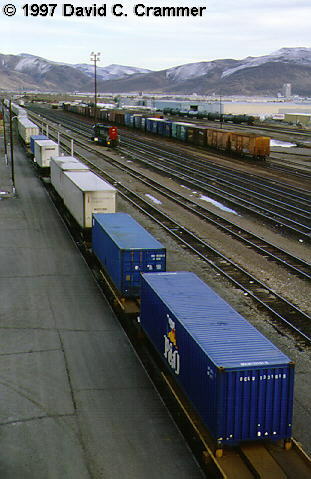 This will be the 1 OANSF 05 (first section of the Oakland to Norfolk Southern departing on the 5th day of the month) with 14 loads and 30 empties. At 3,218 tons it will be rated at 3.8 horsepower per ton (HPT) and without the power is 5,164 feet (5,453 with the power). 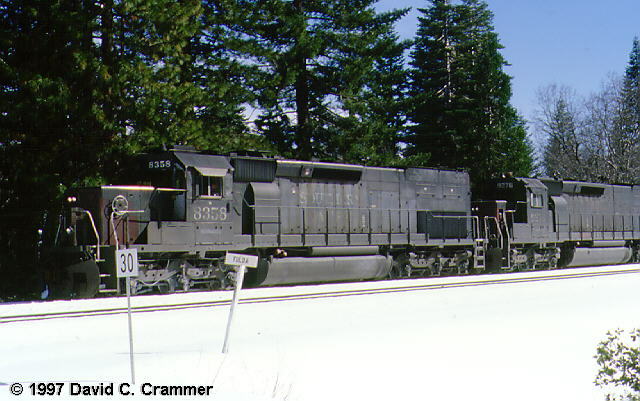 This morning the power will be #8358 (SD40T-2), #9276 (SD45T-2), #7321 (SD40E), and #9388 (SD45T-2). We have plenty of power to make the trip across and since the drawbar limit is 4,500 tons that will not be a concern either so there will be no need to stop for helpers. Dave Belgard will be todays conductor. Dave has been with the SP for 29 years starting in Watsonville and Oakland, Tracy, and now working out of Roseville. He is making the rear air check with Jim Jackson from the car department who is astride his little four wheel Kawasaki with a rear basket that carries among other things brake shoes and plastic and metal straps. Jim has been with SP's car department off and on since 1968 both in Sacramento and Roseville. "You should have air now." The front end to Jim. "OK, air is coming back." "You should have air through the whole train now." While the air is being tested for leakage the hand brakes have been set on 8 cars which Dave will have to knock off before we depart. In the past the brakes were set on five cars at each end but now it is just on the rear. He waits until after the air test so that the cars will not roll because at the moment they are not stretched out. While the train was being worked it was flagged on the head end so when this flag is removed it is called over the radio and Jim steps out of the way for safety. This is necessary since as Dave removes the hand brakes the cars roll backward a few feet since the air is holding the pads off and there is a slight upgrade already. "OK SP 5 here we go." SP 5 is Jim's car department number which is assigned only to him so that there will be no mix-up on other shifts that he may be asked to work and so that there is no misunderstanding as to who is being called over the radio. 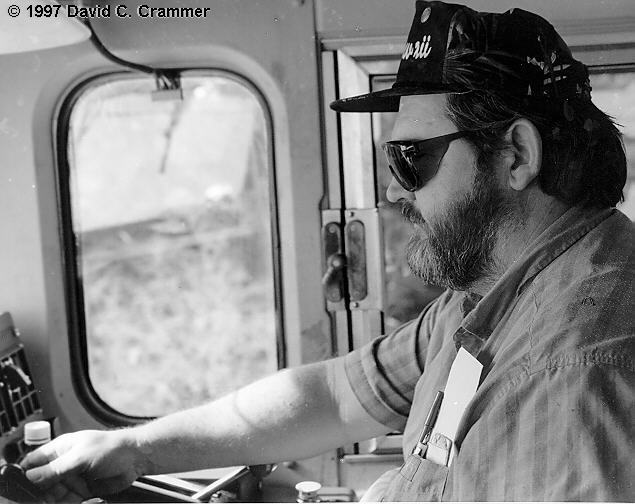 Dave takes the truck over to the head end where engineer Ralph Caddell is waiting in the cab. Ralph started with the SP in 1960 out of Tracy, left for a few years, and then came back to work with the railroad in 1972. The two of them go over the paperwork checking for any slow orders, flagmen, and another items pertinent to the trip. Behind them stretch the ladder of tracks with other blocks of cars waiting to continue on. "Yeah Ralph, you got a highball on #1 track and contact flagman at Rocklin." Usually track #1 is reserved for westward traffic but this morning we will be using it to travel east. As we slowly begin to move forward we can see the snow capped Sierras ahead. They appear as a white line over blue as they stretch out over the foothills. Taking the curve to the left we report out of Roseville at 10:55 and pass the signal 1060 at "Cattleman's" (named for the restaurant htat sits next to the tracks here) which carries the sign "END CTC". The first three numbers on the signal are the mile post number with the fourth number the 10th of a mile so that the 1060 actually means 106.0. Going over the restrictions Dave makes the comment, "This train can do 55 but we can't." Actually according to the speed boards we could do 60 but restrictions and the grade will have us traveling less than this. He also comments that sometimes in the mountains the snow is so bad that you can't see the signals until you are right under them but this morning the skies ahead are clear and blue. He finishes with, "You shoulda been here yesterday." We move forward at a stately 5mph approaching the "Y" shaped yard limits boards. Dave has to make a trip back through the units to check for "Bummies". This is not a benign action since the previous day one of the Roseville PO's arrested a rider who turned out to be a serial killer having beaten several other "Bummies" to death in box cars. As he exits through the rear door Ralph takes us up to 10mph. By now we are passing small streams and pools of water and the green hillsides reflect all of the rain that has recently been falling here. With a throttle setting of notch 4 our speed increases to 20mph on the gentle grade and Dave steps back into the cab to announce, "No bums in unit and all of your power was working." Had there been any unauthorized riders Ralph would have had to stop the train to eject them but now he takes the speed up to 40. Our flagman is sitting in a white car as we pass to give us a rollby. Taking the track to the left we pass some grazing horses and curve back under the bridge carrying the other track. "SP detector MP110.2...track number one...three seven miles per hour." "Highball!" Three ducks rise out of a pond to our left and then seeing that we mean them no harm settle down a little farther from the right-of-way. Continuing our climb we pass a boarded depot at MP 113.5 and by 114 the throttle at notch 8 has us at 37mph. "30" This reduction is required because of the curves and grade which goes from 1.1% to 1.9% and then 2.2%. As Ralph hits the horn for the crossing at MP 116 the miniature horses that are raised here and are in the field to our left break into a gallop away from the track. We pass the "Mandarin Hill" orange grove and then are through PENDRYN (116.6) where the 2.2% grade has us at 20mph. Since this is actually the westbound tracks the east facing signals turn red behind us. Climbing out of Roseville undulations are not a problem since the grade has been constructed to provide a steady ascent or descent. Using fills to keep the climb steady the throttle and braking manipulation needed on the coast are replaced by simply allowing the units to continue at the authorized speed. There are curves though and at MP 118 we follow the line around a hillside and then emerging from tunnel #19 climb the 2.2% grade of the right track curving to the right while #2 track, which is lower and only 1.4%, curves to the left. Any variance in speed is simply due to the change in grade. Coming into BLOOMER'S CUT (supposedly named because the Chinese laborers like to look up the bloomers of any women standing on top) Dave comments that it is so narrow that occasionally the conductor has to walk a load through to check for clearance. At 65 feet in depth and 800 feet long it had to be blasted through what amounted to cemented gravel using 500 kegs of gunpowder a day and kept onsite blacksmiths busy sharpening the needed tools. As we pass through Auburn with its museum depot a giant statue of a Chinese laborer with his wheelbarrow stands to its west side depicts those who made the cut we just passed through as well as the route we will be continuing on. Everything is proceeding normally. Dave radios ahead to a flagman and gets a highball. We pass over a flange greaser and the gates ahead go down. On the steeper grade our speed is now down to 25mph and a man and his dog lean against a fence and wave to us. Below us and to the left the other track is in a cut and then at MP 128.6 we are back together with it again as we wave to a flagman guarding the rail grinder that is working the other track and is the reason we are on #1 today. As we climb through the increasingly steeper foothills there are locked gates guarding the access roads which have been cut through red clay made even darker by the recent rain and with the pine trees on top almost resembles the red clay in Georgia. At MP 130.8 a green signal is on the #2 track and a red signal protects us where they split. Through the cut at MP 131 we can make out the outline on the north side where supposedly a dinosaur was discovered and excavated by the University of California at Davis. We are at 30 mph as we pass it. 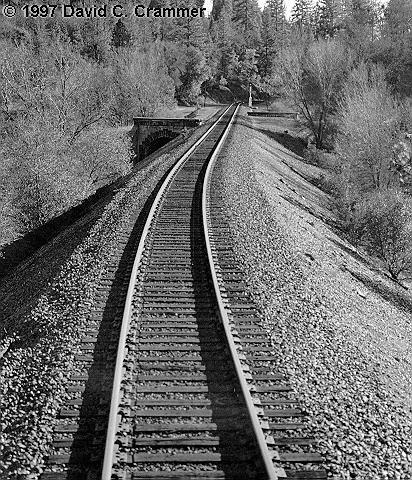 Keeping as steady a grade as possible along the contours of the earth the two tracks still vary as to which is the higher and we cross over its top as it passes through a tunnel to emerge to out right. With several other tunnels it continues to pass back and forth and by MP 134 it is way below and as we come up on I-80 we are down to 25 mph. During all of this climbing (the grades through here go from 0.5% to 1.2%, 1.9%, and finally 2% before leveling off for awhile) the white capped mountains have gotten nearer and the air is noticeably cooler. 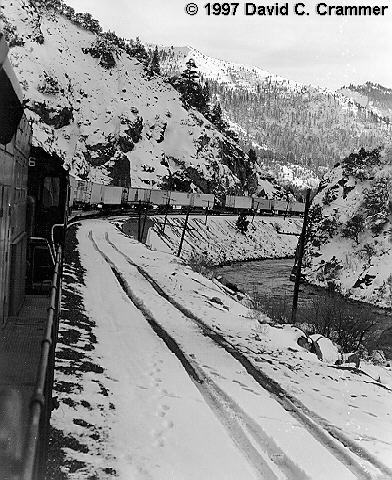 "7649 West with conductor Nelson track #2." Once again we are parallel to the #2 track and listening in on conversations between the dispatcher and other trains on the hill. "8358 for location." From the dispatcher meaning that he may have something in mind for us but first has to make sure where everyone is. "Coming into Colfax right now." 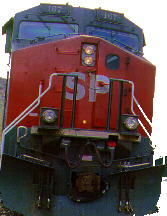 The signal for track #2 at MP 140.4 shows as red. At Colfax (named for Schuyler Colfax who was vice president during Grant's first term) the helper set with a caboose has snow on the sides from the storm yesterday which it has not yet gotten warm enough to melt, an indication of what we will be facing. Here we are actually on a downgrade that goes from -0.1 to -0.2%. We switch over to track #2 to go around CAPE HORN meaning that we will go around the outside of the mountain looking down at over the more than 2,500 foot drop to the American River rather than through the tunnel on track #1. Ralph makes the crossover at 10mph and keeps to this until he gets the word from Colfax that the rear of our train has passed over. "Highball." We are now starting to see snow though it is actually just some that has been knocked off passing units and then we cross over the LONG RAVINE (MP 144.1) bridge that was put up in 1913. The original bridge over the Long ravine was 120 feet high and carried by three truss sections. Past the Ravine we curve out around the mountain climbing a 2.2% and then 2.0% grade and look down over the side. CAPE HORN (MP 146 was carved out of the side of the mountain and looking down the valley and the American River seem more than just those 2,500 feet away. As we round it we again join up with track #1 again which took that shortcut through a tunnel and climb higher and higher though at a more moderate 1.6%. On the eastern end of CAPE HORN Ralph hits the horn for an "X" signifying a crossing and at MP 147 just prior to the cut we can see where the original track went through. A mile later at MP 148 the speedboard gives us a 30-25 which is fine with us since notch 8 has us at 25 already and as we round the curves the flanges make their shrill sound against the rails. We curve under the interstate that we had passed over on the Long Bridge and then over the Secret Town fill which replaced the double trestle that had been built here. The trackside detector gives us another clearance and we are climbing steadily towards the snow which starts to appear sitting in the shade beside the track in a cut where we are down to 18mph despite the 33-30 speedboard. Ahead is the rail grinder which leads to some speculation as to where we will be meeting it and we creep around the curve at 15mph anticipating a yellow flag and possible torpedos. Below is the lake that was originally formed by hydraulic mining techniques using water under pressure to wash out the gold from the hillsides. Dave gets on the radio and talks to the flagmen guarding the grinder about taking the torpedos off of the track after they get in the clear. Ralph brings us to a halt at GOLDRUN (MP 152.2) and even though we have a green signal the actual permission to proceed must come from the crew. Finally we get the word we can proceed and pull forward as the gates ahead come down and we approach DUTCH FLAT (MP 154.1) where the yellow flag is still in place but the torpedos are gone and we have a verbal highball which takes us to 20mph. The signal at MP 154 is one of the newer triangular types with our green in the upper right and we are now definitely in the snow. As we pass ALTA (MP 156) we get a, "Green flag". "Green flag" This cancels out the yellow flag guarding the grinder when it was working our track. We hear the spreader ahead of us requesting to go from #2 to #1 track and then meet with the grinder. Past that we meet with GP40-2 #7649 acting as a single unit work train and upon entering a tunnel melting snow heated by the sun on the concrete facing drips onto the windshield. The service road beside us has obviously been plowed since yesterday and crews have dug out the switches as we pass BLUE CANYON (MP166). By MP 166.8 the sun is shining directly off of the snow into the windshield and sighting on the signals become a little tricky. "SP 8358 East....what speed are you making?" From the dispatcher. This is necessary so that he can check to see how we are doing versus the spreader which is on the same track headed for Truckee (MP 208). Since the dispatcher controls the signal here we are approaching a red absolute which we may not pass. "Hard red." We come to a stop at FULDA (MP 168.8) until the dispatcher determines it is safe to proceed. In the summer quite a few bears are sighted around here but with all of this snow they are sleeping soundly this afternoon. Over the radio #4809 (GP38-2) releasing his track permit all the way to FULDA and heading back to Truckee which means we will be continuing soon. Since this is on a grade Ralph came to a stop with 6 and then set 10 lbs on the brakes. He then put them in the passenger position to avoid leakage. Once he got the green he started to apply sand for traction and then the throttle to give amps before releasing the brakes. We pull past the green signal at FULDA and pass the balloon track used by the spreaders and flangers to turn and approach the next signal. "You've got a green Ralph." 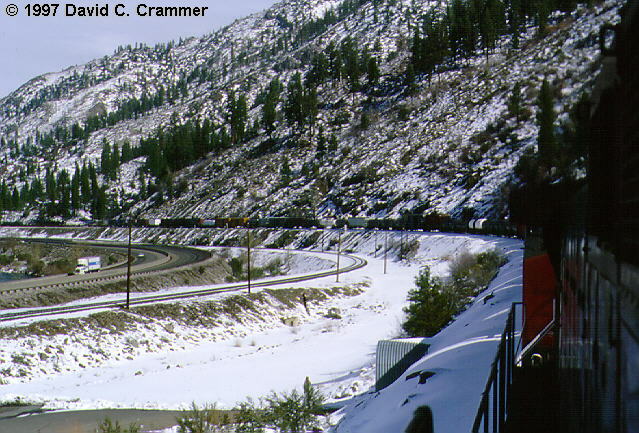 We pass the long crossing at EMIGRANT GAP (MP 171.4) where a crew is digging out a switch, pass under I-80, and onto SWITCH 9 (MP 171.9) where the route becomes single track. Just past this point are the remnants of snow sheds and across the valley is the location of one of the first places to have a telephone in California, the fire spotter for the SP to protect the sheds. It is obvious that the spreaders have been working as the new snow from the past few days is moved off to the side. When it does snow up here a unit can literally get covered in a drift and Dave carries a set of photos of him having to clear off the windshield of a unit that is otherwise completely covered from the porch on up. "Hard yellow" This from the signal bridge at 175.6 as we prepare to pass under I-80 again. Coming through the tunnels icicles are hanging from the ceiling and though the snow has completely covered it we can see where the track removed a year ago and was routed around and outside. We get another yellow which requires some squinting to see against the white background of the hill behind it (MP 177.6). Approaching Shed 10 we have a red over yellow which changes to red over green and under the protection of the shed switch over to track #1 on the right. After clearing the switch Ralph takes it up to 25 at the 1804 signal and we have a green while track #2 is protected by a red. Through the next tunnel, with a separate portal for each track we are cruising at 28mph and pass the "Lily Pond". At the moment it is covered by the snow but in the summer it is a lovely sight with lilies floating on the surface. By now we are far above I-80 and meet with a westbound with a CSX unit on the point and get a hard yellow on the signal causing Ralph to back the throttle down a notch to 7 which puts us at 20mph. Since the westbound meant that the red signal was protecting it and not the spreaders we still have them ahead of us. "Green" As we pass under the signal at MP 186 poles along the track show us the depth of the snow and we cross both the Lower Casacade Bridge and Upper Cascade Bridge. "Green" (MP 1882) The signals here are about two miles apart Ralph makes a running test on the brakes, "Brakes applied". "Yellow over yellow" (MP 1912). At Norden we get a red over yellow and under the massive snow shed the old #1 track curves off to the left and we continue on through wary that the spreader is ahead of us. Past Norden is the "Sugar Bowl" ski area and its lifts cross over the tracks above the wooden shed that precedes the long tunnel #41 which has the highest elevation on the line at 7,042 feet. We have a green at the snow sheds and will proceed under cover for the next 10,325'. When the tunnel was build by crews working from both ends they met in the middle in the fall of 1867 the difference between the two teams was only 6 inches. This precision is amply demonstrated by the fact that in daylight when you enter from one end there is a minute glimmer of light ahead which logic seems to dictate could not possibly be the other end until it becomes progressively larger as we approach and finally emerge back into the snow covered mountain sides. On the sides of the tunnel a vent system provides breathing bags that are good for 20 minutes of air should a crew become stuck trying to get a stalled unit going again. As we emerge we hear the detector ahead give the speed of the spreaders as 22mph so there is no point our train coming down at 30. Instead Ralph keeps us at a safe 28mph on the 1.8% grade. While the route up took a much longer time and the path down is shorter there is also the fact that our starting point at Roseville at around 200 feet above sea level was much lower in relationship to the mountain than is our destination at Sparks at around 4,500 feet meaning that we will not have to descend as far. Taking advantage of the curves of the mountain we start on the massive horseshoe curve that will end up with the train on the track we can look over the ledge and see parallel to us far below. It will take eleven miles of track to travel a direct line of eight. Because of this even though it is late afternoon and we are an eastbound the start of the descent has the sun shinning directly into the windshield at MP 202 and coming in over Dave's shoulder at MP 205. 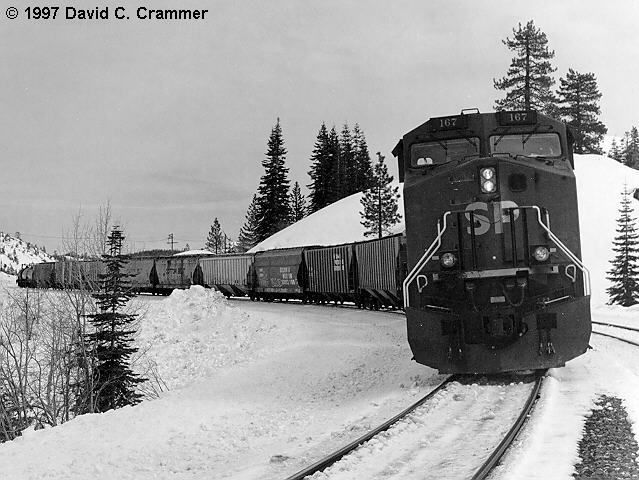 Looking back at this we can see the tunnels and snow sheds above and to the left and the signal gives us a green at 2058 meaning that we will probably catch up with the spreaders at their home in Truckee. Coming out of Truckee (MP 208) and beginning to follow the Truckee River the grade is flatter allowing the dynamics to be set at 3 which holds us at 40mph. The old signal bridge has had its signals removed and switched over to the triangular style further down. The new signal has added a blue tinge to the green which makes it a little darker and thus easier to see. By 212 we are running along side the river and Dave points out where earlier in the week he spotted a pair of eagles. The dynamics are now at 5 as the grade has steepened and by 224 the snow is starting to melt. Above the river are the flumes that carry water to the power plants situated on the river. Ice cicles hanging below testify that the system is not completely leak proof. On the timetable the mileage between Roseville and Sparks is listed as 139 and around MP 228.5 we pass the small concrete marker that signifies our entry into Nevada. We cross the river on the smaller of the two bridges since we are back on Track #2 and as we come through VERDI (MP 231.8) meet a westbound with mid train helpers which is on the westbound track above us. Coming out of the mountains we are once again in the hills. Of course since the eastern slope Sierras is a lot steeper here there are a lot less of these foothills than on the western slope. Some of them still have snow sticking to them from the storm yesterday but it is a rather thin coating. Over the radio we hear the dispatcher giving a track warrant between the Truckee crossovers and East Truckee on the #2 track. The high/wide detector gives us a clearance but this is rather academic since we are already past the tunnels and then we see the skyline of Reno in the distance with its skyscraper hotels and casinos. As we pass through the lines of buildings pedestrians either wait on the sidewalks or use the overhead walkways that some casinos have built to provide easy access for the throngs of gamblers. Over the radio Dave is in contact with Dan Lee, this evening's Spark Yardmaster to see how he wants the train handled. As we arrive at 5pm he has instructions to set out the head four cars on yard #3 and then another crew will take over while he and Ralph take the van to their hotel for the night. The next morning finds Yardmaster Jim Buker in charge. Jim has been working for the SP since 1962 which means 34 years in June of 1996. 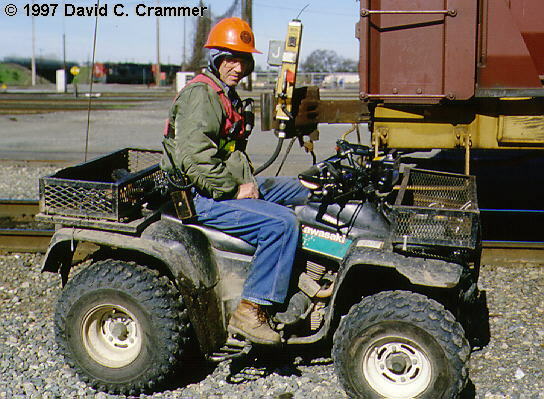 He started as a switchman in Klamath Falls and became a yardmaster in 1974. From his desk in the tower he can look out at the building housing Harrah's Automobile Collection to the west. GP40 #7623 is ready for any switching assignments and two rotary plows (#205 and #208) are parked to the north of the office. There is a light frosting of snow on the mountains surrounding the bowl that Sparks and Reno sit in and the sun begins to lighten them. Over by the Nugget Casino the Fun Train sits with SP #8593 (SD40-2M) on the lead end of the Amtrack equipment. This will be wyed coming out for the trip back west. Dawn at Sparks is an adventure in lighting. The sun comes up over a notch in the mountain to the east but the first sign that it is about to break is the snow on the hills to the west shining against dark clouds and then the whole ring of hills become stark white before turning to a softer grey. As the sun raises itself up and out into the open there is no haze in the air to disperse it and Jim has to pull the shades in the tower to keep it from overpowering his computer screen which is partially protected by a makeshift sun shade formed from a cardboard box. He has the speaker phone on so that he can listen to the morning conference call as to what is happening on SP's western division. On his fax machine sits the latest weather report from GOLDEN WEST METEOROLOGY. This lists the information upon which his route to the sea depends. WEATHER SYNOPSIS: A large sub-tropical weather system occupies the eastern Pacific west of the Pacific coast. Much of the energy from this system is moving into Washington and Oregon, however the southern end of the weather front will move through California over the weekend. I-80 CORRIDOR: From Roseville to Elko: No significant weather today or Friday, clouds Saturday with light rain likely with snow level at Norden. Nighttime temperatures at or below freezing from east of shed 10 to Elko. Above freezing daytime temperatures with high avalanche danger from tunnel 41 to Stanford Curve. Long range forecast charts suggest a stronger system moving in Monday and Tuesday. This system could be a mild one with rain at the highest elevations causing snow melt and runoff below 7,000 feet. By 8 AM the temperature is showing as 30 degrees on the thermometer outside the office. In the office Engineer Jerry Colvin, Conductor John Valdez, and fireman John Souza are busy going over the paperwork for the 2 RORVM 1 05 (from the Roper Yard in Salt Lake City, Utah to Roseville). With 49 loads and 25 empties it is at 6,907 tons and 5,985 feet including the units. It will be making the trip over the hill with just two of the new AC4400's on the point (#167 and #277) which means they will be using mid train helpers for the upgrade. 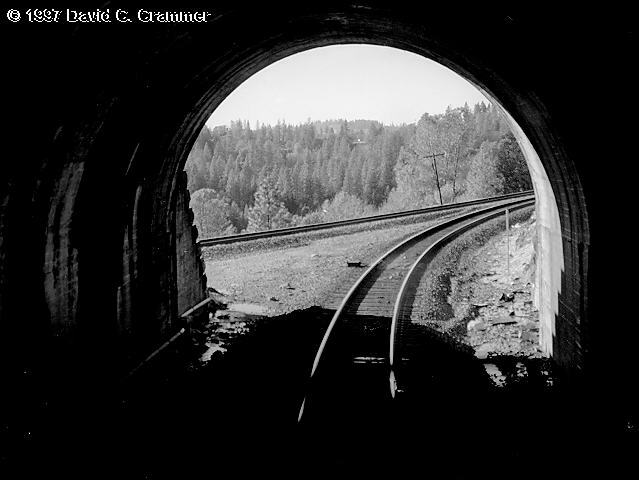 Because of a high load they will be restricted to 10mph through the tunnel at MP 117.39 and not to exceed 10mph on the #2 (eastward track between Bowman (MP 129.2 and Rocklin (MP 110.6) until 4 PM. Jerry has been with the SP 25 years starting out in Roseville as a fireman/hostler on 1-30-69 and has been working the Hill as an engineer for the last 12 years. John Valdez hired out 16 years ago as a clerk and worked as a telegrapher, freight agent, and in 1989 transferred to dispatching acting as the chief dispatcher at Roseville for 2 years ending up in train service only a year ago. John Souza is a very junior employee having joined the SP only a years ago having become bored working as a mortgage maker and accountant and finally deciding what he really wanted to do was work for the railroad. They will all depend on Jerry's experience and skill to bring the train safely over the hill. While Jerry and John Souza take a van to the head end John Valdez takes the truck back to the rear to put in place a two-way telemetry. This allows the engineer to dump the air on the rear of the train in case there is an obstruction in the line. With it in place he joins the other two at the head end where they again go over the restrictions. "Sparks tower gave us a highball whenever we're ready to go." "Have to wait for the switcher to clear in front." They wait while it moves across the tracks and then their conductor is out to realign the switch in front of us. Jerry hits the horn and the bell, eases on the throttle (punching the throttle on an AC4400 can mean breaking a knuckle because of the speed with which it can accelerate), and calls the dispatcher on the phone to let him know we are on the move at 9:15 AM. This morning our dispatcher in Denver is #74 Marsh Walker who the crews have nicknamed Marshie. The diamond on the switch in front of us indicates that we will be moving over on the track to where we have a green signal ahead at 2451. As we pass the sign that reads, "CHECK YOUR RADIO CHANNEL WB 160.32" both Jerry and John Valdez reach up over their heads and punch in the appropriate channel changing it from 96 (161.550) to 14 entering the numbers twice for both send and receive. He hits the horn again for the first crossing and we are approaching Reno with its white buildings against white mountains and grey clouds. 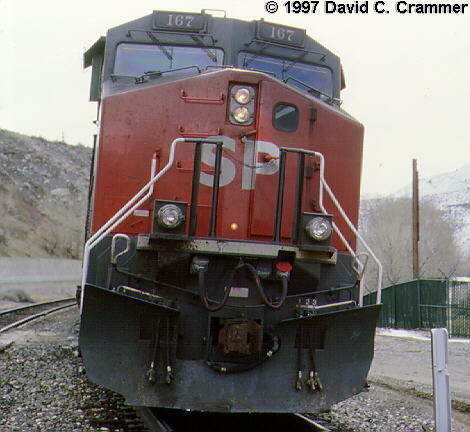 "SP 167 west yellow red flag." A yellow red flag is formed by triangles of red and yellow which protect men and equipment. As we move slowly forward at a restricted speed for the next two miles two torpedos explode under the unit and we can smell the gunpowder. Hopefully no one mistook those two sharp reports for gunfire. "SP 167 you're looking good...highball the rollby." "Highball the rollby." Once again we are passing through Reno past the casinos with people waiting to cross. On the computer screen in front of Jerry we are at 10mph with the throttle at 4 and then as we leave town he takes it to throttle 7 and then 8. We pass a speed board reading 45-40 but we are at 25 with the engine RPM at 1050. The speed is displayed on the monitor to the right as the traditional circle and arrow while on his left monitor there is a digital display. As the big units develop a feel for the road our speed is up to 31 and Jerry hits the horn for a work crew. Since we will be cutting in mid train helper John Valdez is on the phone setting it up to have them join us at LAWTON (MP 238). We pass the detector at MP 240 and get a no defects, our length at 4,664, and our speed as 31 MPH on track #1. At Lawton Jerry gets in next to the switch to get into position since they will be cutting in 34 from the head end. This is because they will be cutting in with half of the rated tonnage of the helpers behind them. Ordinarily they might simply sit at the rear but because our rear consists of empties this is not allowed. The helper set of #8624 (SD40-2M rebuilt by MK), #8364 (SD40T-2), and #8528 (SD40T-2) pass us on the other track. "You'll be shoving against a SSW 88132" giving them the number of the car. "167 I need a pin." We back slightly. "OK take em ahead 167." "Cuts made about 6 to a stop." "That's good 167, you can stop." "OK that looks good...you can take em the other way." While we wait the signal ahead is green for westbounds and then it is time for the air test. "SP 167 the helpers are cut in." "OK helpers I'll make a little reduction." "OK on the helpers." We pull forward. "OK SP 167 helpers moving." "Fun Train about 10:45 out of Sparks." The Fun Train has loaded aboard its gamblers and is moving out behind us as we pass under the 2371 signal. With the helpers our speed is now 38 MPH as we pass 2331's green signal and then spot an eastbound freight on the lower #2 track. By MP 231 we are back in the snow passing two horses in a field trying to uncover some grass to dine on and finally pass back into California at MP 228.5. Along the river are some flat spots and curves which require throttle manipulation. Jerry takes us from notch 8 to 7 to 6 and finally to 5. 5 has our engine rpm at 992 and a speed of 40 at the 2811 signal and then lowers it again to 4 which still keeps us at 40 MPH with the RPM now at 885 and a gross horsepower of 1500 since we have the helpers also shoving and is down to notch 3 by BOCA (MP 216.3). Our train continues to curve along the bank of the river and then cross under I-80 at MP 2147. As we begin CTC at 2107 we have a flashing yellow and John calls this back to the helpers to let them know that we will be reducing speed as we pass a 33-30 speed board. The next signal gives us a green and Jerry puts us back up to notch 8 but by now the grade is beginning to tell and this only takes us to 27 MPH with a gross horsepower of 4401 showing on the screen. 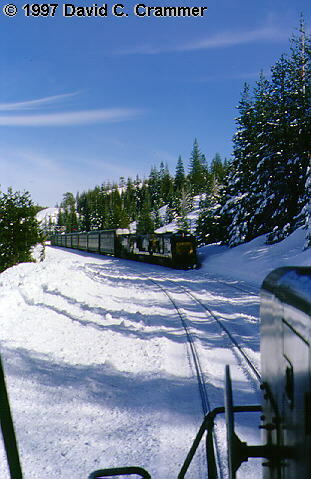 Over the radio we hear the dispatcher talking to the Fun Train but Marshie is still giving us green signals as we look down on Donner Lake which this morning has some wind ruffling the surface. By now our speed is down to 22 MPH and we can see the long snow sheds ahead curving around the mountain and as we enter the first have a green signal just before the single track. Climbing here is all notch 8 with an occasional punch on the alerter to let the unit now the engineer is awake. At 195.3 we again enter the long tunnel though this time headed west and again can just make out the opposite portal. The grade just before the tunnel is at 1.8% and once inside varies from 1.5% to 1.1%. In order to ensure that we do not stall in the tunnel and need to use those air bags MP 201 is the cutoff spot. If the train is not moving at at least 14 miles per hour it must either call for helpers or double the train over the hill. "Helpers exit." The helpers call over the radio that they have exited the tunnel as we approach Norden. This is a relatively flat spot where we can cut off the helpers and then charge the train. "Helpers off...take em ahead." We pull into the east end of the massive Norden shed and then out the other side. "Coming out of the shed three unit lengths." "By the time you get em stopped that'l be good my man." "Ready to go into the siding at Norden." "The Truckee helpers will tie up at Truckee." This from the dispatcher who then gives them permission to pass the signal indicating stop so they can back into the siding and clear the track. "SP 167 helpers in the clear on the siding." The dispatcher then gives us permission to back our train passing the signal indicating stop against the rest of our train. The helpers also call over the radio to say that they have realigned the switches for our move. "OK Jerry they're coming out of the shed." "OK SP 167 30 cars to go." "7 to 8 to a stop." "167 good joint cutting in the air." Of course as each of communications came over the radio Jerry confirmed the reception by repeating them as we backed through the shed. With the connection made it is time to charge up the air and talk to the dispatcher who gives us track #2 and we have a green but Jerry waits to get a few more pounds on the air just to be on the safe side before going down the hill and while this is taking place pulls out his lunch bag for a little food break. Of course sometimes waiting to build up that extra pressure can cause more than just a little delay. Marshie comes back over the radio to inform us that he is knocking down the signal in front of us and holding us for the Fun Train that is now coming up the mountain behind us and suddenly we are staring at a double red. The Fun Train will actually be running around us on the siding. Track #1 used to run through Norden but it was taken out and while we are on what is now termed the main the track to our right is designated as a siding. While we wait the dispatcher is also trying to get a location on westbound #111 and also on an eastbound that is around Fulda. Then Jerry spots the fun train coming up beside us in his mirror and John descends to give it a rollby waving to the crew as they dive into the shed and are gone. Our signal resets to red over green and we will switch over to the north track. Coming down the grade out of Norden we are in dynamics 8 at 24 MPH and over the radio comes the report of a detector giving the Amtrak that went around us a speed of 33 MPH. We are heavier and Jerry wants to make sure he has everything well under control and he manipulates the controls with surgical precision. We meet #101 on the point of an eastbound coming up track #2 at MP 182 and before CISCO (MP 180.3) he needs to use a little air. 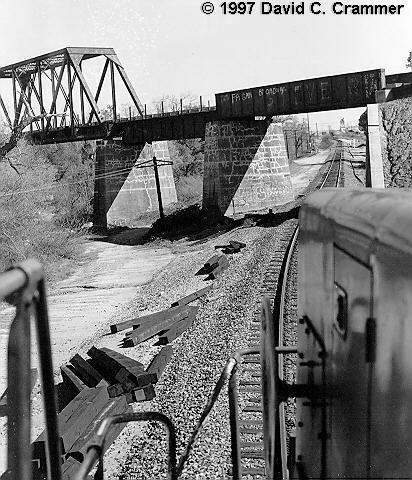 As we head down the grade the flanges squeal against the rails on the curves whistling back along the train. On the control panel under a red protective cover sits the switch which he can activate to dump the air from the rear in the event of a brake line failure. We are still in the snow and the crews are up and doing their thing keeping the rails clear. From our moving perch looking over the rim we don't want any problems from snow that has rolled off of the high banks. As our speed picks up Jerry dumps some air for additional braking which brings us down to 22 MPH and then he backs the dynamics back to 4 and we jump back and forth between 23 and 24 MPH as ice from a tunnel drips onto our windshield. At 1803 we get a yellow signal and Jerry calls it over the radio and slows us to 10 MPH in anticipation of the next signal. We creep around the curves while John Valdez tries to make contact with Marshie. We are t 7 MPH as we round the last curve and are confronted by a red signal at SHED 10 (MP 179). "SP 167 west to SP Denver Dispatcher 74 over." Jerry brings us to a complete stop while we wait to see what is happening and while the unit idles John opens the window to allow in some fresh mountain air. "SP 167 west what is your speed down the mountain?" Marshie is checking to see how much time it would take us to clear the track ahead. What we are apparently waiting for as gleaned from radio conversations is a rail grinder working ahead which must cross over to get out of our way after an eastbound passes. Ahead of us we hear a train reporting a flashing yellow on the radio. Ahead of us, coming around the curves as it works its way up the mountain is an eastbound with a line that consists mostly of empty auto racks. The two Johns get down to give it a rollby and when it finally passes call it over the radio. By now it is time for a change of shifts in Denver and John McGee takes over as #74. He takes the red from in front of us and replaces it with a green letting us proceed on our way again. The rail grinder has moved over and after making the confirmation that we are a 25 MPH train lets us through SHED 10 and onto single track. As we emerge from SWITCH 9 (MP 171.9) an eastbound is waiting for us and we see him framed under the highway bridge. We are green at 1707 and green at FULDA (MP 168.8) as we continue down. We can see that the rail grinder has been through here by the blackened snow between the rails. "SP detector milepost one six seven point seven track number one two five miles per hour no defects no defects"
Coming around the horse shoe curve we can visually inspect the rear of our train and as we approach the tunnel can see the rail grinders lights inside staring out like some giant predator. As we pass it in the dark sparks are flying under it from the metal it is working. 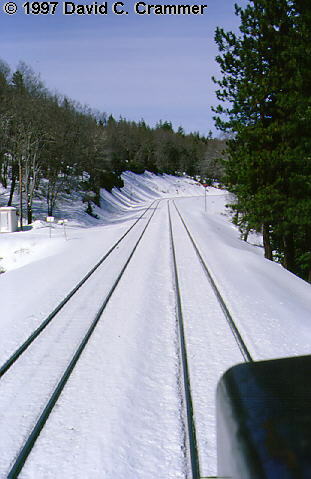 By MP 162 the rails are now clear of snow though there is still some in the shade of the trees on the hillsides. Melting snow means that rivulets of water are running down the hill and eventually into rivers which means good news for southern as well as northern California but bad news for the crews who maintain the roadbeds. To handle the water running down between the two tracks tiny culverts have been laid under the roadbed and rails shunting the streams off to the side. Out of the snow we begin to see more of the "X" signs for Jerry to respond to and ahead the sun is glinting off of wires. Even though we are on a relatively flat spot the weight of our train behind us is pushing us at 25 MPH with the dynamics at 6. On these curves the flange greasers are important since without them we would probably be peeling off more metal than the actual rail grinder. Of course there are more greasers on the #1 downhill track than the #2 uphill since a slick track could cause a train to stall on the grade even with sand. As well as greasers we pass over some dragging equipment detectors and to the side old rail has been propped up to keep the hillside from washing away. At MP 143 Jerry finally has to give the throttle a tweak and then takes it all the way up to notch 8 to keep us at 25 as we pass through Colfax with its helpers back on their siding. Out of Colfax we hit the Weimar Flats and Jerry puts the throttle to 4 which now has us at 30 since after we passed over the Long Bridge (143.6) to the east of Colfax we became a 30 MPH train but at MP 136 we go back to 25. Anticipating this Jerry starts slowing the train at MP 137 while John Valdez uses a cellular phone to let his wife know approximately when he will be home. Through here we are again traveling across the high fills that the railroad used to maintain a steady grade over a naturally undulating terrain. As we pass MP 133 John calls Denver to let him know and the dispatcher tells him to pick out a nice spot to sit for a spell as he is going to be holding us for Amtrak since the Fun Train is still ahead of us. With some trepidation we round the corner for the next signal only to discover it is green and we keep moving at 1317. At MP 131 the light is perfect to illuminate the outline in the rock where the dinosaur was supposedly removed (which is why MP 131.2 is called DINOSAUR CUT) and then...AH HA!! A hard yellow at 1303. Jerry calls it over the radio. "SP 167 west yellow signal over." There is a work crew ahead and the dispatcher wants to make sure everyone is clear before they run Amtrak on the #1 track as it is now on #2 track. "Red signal" We stop at 129 and even though the time is up the crew have not released it yet and in fact they call over the radio that they can't release it yet. Once Amtrak is allowed to leave we get a yellow and since it is now past 4 PM we don't have to worry about the 10 MPH through the tunnel plus we will be going down track #1 totally eliminating the problem. As Jerry gets us under way again he puts the unit into dynamics 3 which shows on the computer screen as "B3" and the speed at 19 MPH. The next signal is a green and Jerry changes over to throttle and the screen displays this as "N3". Below and to our right track #2 is in a deep cut and as we pass through Auburn the sun is shining directly into the windows and "B4" has us at 20 MPH. Once again past the depot with its Chinese laborer still pushing his wheel barrow we say a quiet thank you for among other things the way the men he represents carved the mountain passage around THE HORN, through BLOOMER'S CUT, and helped to tame the Hill. "SP 167 west yellow signal." At MP 123.7 and then we are back through BLOOMER'S CUT again. Over the radio we hear a discussion between the work crew and dispatcher that the Amtrak is just passing them. The dispatcher then informs them that #167 should be right behind them. "SP 167 west yellow signal." The flagman calls for our location and we give them MP 121. We're doing 15 MPH at "B7". Looking through the hills we can now see the delta stretching out below us. "Green" We have a green signal at the tunnel and pass the gang and at "B6" are at 24 MPH. We pass over the high fill at 1187 and hear over the radio, "SP 167 west highball the rollby." This is from flagman Willy Boroughs. "Highball the rollby...thanks Willy...see ya tomorrow." To the flagman. Apple blossoms are now beside the track in sharp contrast to the high banks of snow earlier in the day. Grades here can be deceptive since we no longer have the mountains to emphasize them. We pass through PENRYN with its 2.0% at "B7" and 18 MPH and then as the grade increases "B8" at 25 MPH by 1155. Over the radio we hear that #5 Amtrak (the California Zephyr) is behind us so the chances that they will hold our train out of the yard are slim. However there will be some delay and Jerry brings the speed down to 11 MPH anticipating the red signal that we now see ahead of us. John tries to call Amtrak but he has apparently changed to channel 96 after ROCKLIN (MP 110.6) so he punches this into the panel above his head and then with still no response goes back to 14 to check with the flagman. Jerry pulls up to the red at 1141, blows the horn and then pulls through at restricted speed meaning that he must be able to stop within half the field of vision. Ahead a signal maintainer is flagging a crossing for us as works on a crossing gate and we wave to him as we pass. #5 calls for our location and John tells him we are flagging the signal and the next one gives us a green (1129). The crossing gates go down and the cars stop. Everyone is happy and safe and we are moving again. Ahead on a sign post is the message "CHECK YOUR RADIO CHANNEL". John and Jerry have already made the switch to 96 and we call the Roseville Tower to let them know we are at ROCKLIN. Every run has its legendary halfway mark such as halfway from Barstow to Hobart on the Santa Fe is BANDINI which sits just outside the yard. At Roseville it becomes halfway between Sparks and Roseville is ROCKLIN. Tonight they are bringing us straight in telling us to come on down #9 and set out one car at the yard office and take the rest to the hump. The conductor to stay on the train at the office and the herder will take it from there. We get a highball for #9 and with the setting sun right in our eyes have a yellow as we enter yard limits. On notch 4 (N4) we pull into the yard at 9 MPH. Ahead is the headlight of an outbound. Signals ahead show a double red and the track shining from the last rays of the sun shows the direction we are lined for. Over the radio we hear, "#9757 waiting to depart." It is an empty coal train waiting its turn to challenge the hill. The Hill will still be there as it has for millions of years and men will continue to challenge it. In geologic terms it is a young hill that is still growing but so is the mind of man coming up with new ways to cross over. From 41 miles of snow sheds to rotary snow plows. From steam locomotives to AC4400's. And when old railroad men sit around the kitchen table or the fireplace they will swap tales of what it was like to run it. Making a successful run over the hill requires a lot of talent. In preparing this article I want to thank Jim Jackson, Dave Belgard, Ralph Caddell, Dan Lee, Jim Buker, Jerry Colvin, John Valdez, John Souza, Rob Carlson of Altamont Press, and Jack Martin.